Day 27 was a spectacular day because 1. It was Veteran's Day and a beautiful reminder of all the men and women currently and formerly in service for our country and 2. it was my husband and I's one month wedding anniversary (whoooo! I can't believe it's already been a month since we said "I do"). Since we spent most of the day together writing some thank you notes, running errands, and taking our dog on a long hot walk, I was in workout clothes. 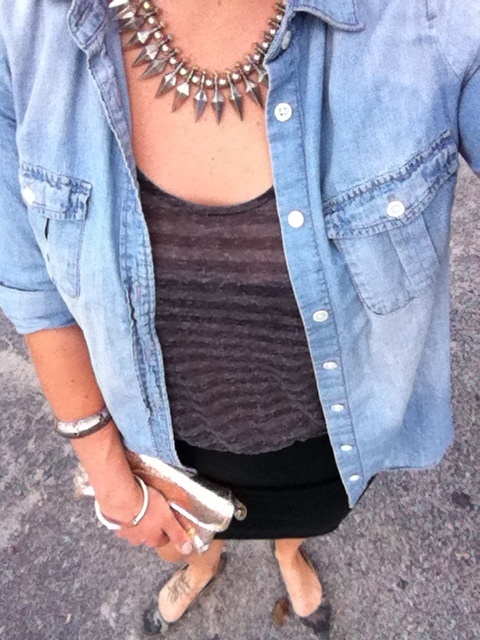 I got myself together and in chambray for our date-night-dinner-out. I chose an easy dress (we would be eating amazing farm-to-table food AND drinking) and my light denim chambray to compliment the grey undertones of the dress and earth-tones of the flats. I also rocked my new spiked necklace as a mixed-metal muse that I carried out in my bracelets and Stephanie Johnson clutch. I highly recommend The Rusty Spoon if you're looking for an amazing Orlando restaurant. You can check them out here.